Kayla Jewel Gillies: ONE MONTH OLD! YAY! Little Miss Kayla is one month old today! ... Where did the time go!!? 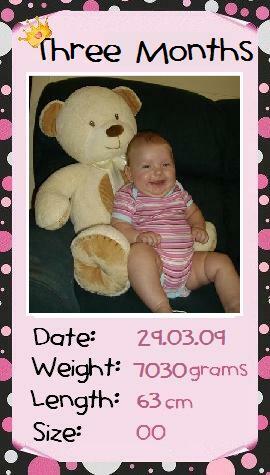 She is still so little but she is actually quite huge compared to the baby bubette we took home from the hospital! ...and I thought Cooper was tiny! So far she has been a pretty good baby! The only problem we have lately is a few too many sleepless nights. The problem is she LOVES to be cuddled! She absolutely loves her attention that when it comes time to sleep, she does not want to be put down! She sleeps just fine when she is in somebodies arms, but the moment you try to put her down she starts DEMANDING to be picked back up again! It's not so bad during the day, but at night from about midnight to 6am when Mummy is trying to sleep, she just wants to be cradled ALL THE TIME! We've tried to let her settle on her own and not give in to her demands... but the screams just get louder and louder! She's definitely not crying for any other reason that we know of because she automatically stops crying as soon as she is picked up. The cheeky thing even cracks a little smile as if to say "na na na na boo boo, I've got you wrapped around my little finger!" lol! I've tried everything! Wrapping her up, putting a dummy in her mouth, rocking the bassinet... everything!!! I even cradle her to sleep and wait a good hour or two until she is in a deep sleep before I discreetly put her down (so she wont notice) but she always wakes up and starts screaming again! Some days I feel so jet lagged! But I have been getting a lot of help from Dan and Mum. Dan is great and supportive and helps me through the night even though he has to get up early the next morning for work. (Poor bugger!) And Mum comes and helps out whenever I need her, and she takes her for the day every Friday so that I can catch up on my rest to do it all over again. She's got a wee cold at the moment too so she demands some extra TLC lately, but hopefully she will start to settle down as time goes on. But other then that small attention seeking problem, she is the cutest little girl and lights up our day with her bubbly personality and her heart melting little smiles even when I am dead tired to the world!!! OH WOW!!! A month already?!!! 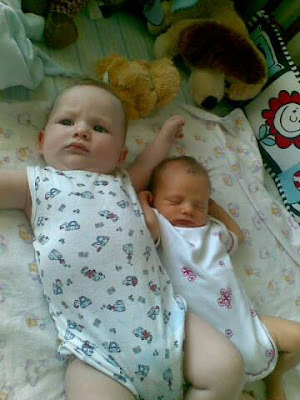 Gripe water or Infant's Friend work well for Cooper - the Infant's Friend suits him better. And when he does have his restless times a nice warm bath followed by being snuggled up in his pj's and his fave blankie help to settle him down. As for the bed issue; there's a snuggle bed you can buy (approx $50 unless on sale for less) from target,toyworld or toys'r'us, and pretty much any place that sells baby stuff. Its just a secure bed with hard sides you can sleep bub in in your bed and it saves you from the concern of rolling onto her - have a look at one to get a better idea what I'm prattling about. Uncle Dava also suggested maybe putting her on a soft pillow that puts her in a position similar to being cuddled? Also there is a herbal concoction by Brauer's with different herbal blends for different things to help the bubs. We got Taz on Calm which helps to settle her for sleep time, there's also other ones such as Recovery tonic (for when bub's been ill) and there's one to help settle the tummy from wind and colic. Naughty naughty Kayla! Bonnie was the same for having to be held all the time and the moment we'd put her to bed, swearing that she was well asleep, she'd wake up waling for her cuddles again! She absolutely hated her cot so we got her into a single bed as soon as she was walking at 11 months. Unfortunately I have no advice since I just put up with it but it looks like you have had some good help there. Hey my sweet! I had the exact same thing with Joseph....it's called the 'first baby syndrome'! (that's what I call it anyway). The mistake is, when she was born, you just kept cuddling her all the time (okay, I know not all the time cause you couldn't to start with, but you get my gist) and as soon as she cries, you pick her up...so she now knows...cry...you'll pick me up! With Joseph, I never thought I would be able to sit down and have a meal with Andrew again...cause he always had to be held!!! And like Jaq, I just put up with it. When Dill came along, I didn't have the time to cuddle him none stop cause I had to look after Joseph as well. And guess what? He was the most easiest baby in the world, hardly demanded attention, cause he hardly got it! hehe. As hard as it is, you have to try and get Kayla in a routine at night time, put her in her cot, let her scream, walking in the room like every ten minutes, not picking her up, but just soothing her with the sound of your voice, walking out again, and repeating the process. But she's only a month old, and the first three months are the hardest. I have my favourite book winging it's way to you via Granma...What to expect in the first year (not my original one, I handed that out years ago!) It's a godsend...helps answer all your questions! Aw Rach what a traumatic time you have both been through I really feel for you darling. Sam - Yeah I thought of that, but a midwife told me that being a newborn they are too little to let them cry out without attending to them. She said to wait until they are at least 3 months before you should ignore their cries when it's just to be cuddled *shrugs*. And as I said in the post... I have tried that but she just doesn't seem to stop, and it's only been more lately that she has been crying to be picked up. Despite what others say you can not spoil a baby. They know when they cry and you comfort them their needs will be met. You want to make sure you are doing that. My little Choo Choo was like that. I bought a baby sling and carried him around in it. Then a baby swing. Try having the bassinet next to your bed. Can you get a vibrating one, or a baby chair. Best of luck to you three. Cherish this time it goes by so so fast!